Beauty aspirants are in the quest to acquire skills in various genres of skin, hair, nail and spa treatment. Makeup artist profession is extremely rewarding as there are infinite options that come along with it. Be it lavish brides, glossy magazines, catwalks, pop videos, advertising campaigns, fashion shoots, celebrity makeup, the options are never ending for a professional makeup artist. Picking the perfect course is crucial for the success of your work. 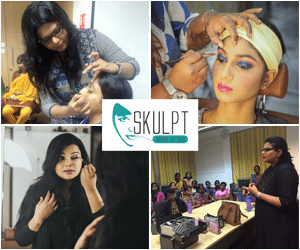 Skulpt offers premium courses at competent fees from industry specialist to meet the beauty needs of all ages. Our comprehensive course is structured to offer wings to your passion. The courses are suitable for a wide range age group and interest groups. Professional makeup course offers different makeup techniques by the widest range of seasoned makeup artists. The small class size and personalized attention from experienced tutors makes the course popular among beginners. The internship program helps to earn while you learn. The course is designed to meet the industry needs. At Skulpt we give importance to fundamentals to give the candidate an entry into a new career. What makes our course special is the value added skills like hygiene, etiquette and communication. These are important to give your career a boost and turn you into a successful makeup artist. Being passionate about producing top caliber makeup artists for the high demand industry of today, our makeup courses are holistic and up-to-date. Fundamentals and advanced makeup techniques are covered in the course. Bridal makeup, HD makeup, HD Airbrush, Airbrush tanning, equipment training, event makeup, runway makeup and much more. Basics of marketing and business management are included to help the students open their very own beauty salon. False eyelash fixtures including individual lashes, winged, natural, doll lashes and more. As part of the final project, personal portfolio for each student is created using top notch photographers and professional models. Anyone with passion for beauty and willing to learn new techniques with dedication are eligible for the course. No prior experience in the field is required.